The problem continues to haunt the grouping fifty years on. With ASEAN marking its 50th anniversary in August, the World Economic Forum on ASEAN, held in Phnom Penh last month, was supposed to be a showcase of regional unity and pride; pan-Asianism, but not in the Japanese or Chinese hegemonic sense. The regional bonhomie didn’t start well, at least for me. A pair of Singaporeans told me over lunch how they wouldn’t step out onto a Phnom Penh street unless a taxi was waiting, adding, without much need, “because it is so dirty.” The Cambodian people, in their view, were to be judged like the littered streets. But from the Forum’s speakers, one heard nothing but optimism in regional cooperation. Cambodian Prime Minister Hun Sen spoke about the dangers of “anti-globalization and protectionism” and “nationalist and populist politics,” although he launched into a nationalist and populist tirade against foreign-owned newspapers in the country, saying that journalists who are “working for foreigners, are actually the servants of foreigners”. Fine words. But nationalism remains the reason why ASEAN has so far failed to live up to peoples’ expectations – even if those expectations were low to begin with – and why any concept of a regional identity is still nascent. 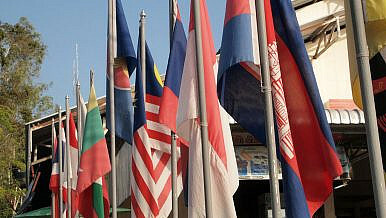 ASEAN Community shall be established comprising three pillars, namely political and security cooperation, economic cooperation, and socio-cultural cooperation that are closely intertwined and mutually reinforcing for the purpose of ensuring durable peace, stability and shared prosperity in the region. It is generally thought that Singapore was among the leading proponents of an economic community – the ASEAN Economic Community (AEC), which officially started at the beginning of last year – with the intention of boosting regional trade. Indonesia, meanwhile, championed the political-security community. As for the “sociocultural community,” they agreed that “ASEAN shall continue to foster a community of caring societies and promote a common regional identity.” However, it “was apparently brought in almost as an afterthought, at the Philippines’ suggestion, in the interest of rounding out the concept of a community,” reads a recent essay by Filomeno Aguilar Jr, of Ateneo de Manila University, in the journal Sojourn. Nonetheless, it had supporters in high places. “Southeast Asia cannot be an enduring security community or an effective economic community – indeed it cannot be an ASEAN community, in its truest and deepest sense, without being a socio-cultural community,” the bloc’s former Secretary-General, Rodolfo Severino, once said. Yet, it isn’t. This, however, is somewhat to be expected. Unlike the European Union – which ASEAN is often compared to, often unfairly – Southeast Asian has thousands of different languages, not dozens. Indonesia has more than 300 native languages by itself. Three major religions separate the region. Some countries share a relatively similar official language, though with obvious differences in dialect. Most countries do not share a historical colonial aggressor. In fact, most still harbor greater resentment about occupation or invasion by their neighbors than by Europeans – Cambodia being a perfect example. “Indonesia,” a term invented by the English anthropologist James Richardson Logan in an 1850 text, was sometimes uses in the late nineteenth century to mean much of what is now Southeast Asia. And proponents of the term argued well into the 1950s that it could apply to both the country, since anti-colonialists adopted the term, and the region – much as in the same way that “America” is used today for both country and continent. In the English-language, it is generally believed that “Southeast Asia” was coined in a 1847 book by the earlier mentioned J.R Logan but didn’t became an accepted term until a century later when, during the Second World War, Louis Mountbatten formed the “South-East Asia Command” (though, this never included the Philippines nor islands east of Sumatra.) German-speakers, however, have used “Sudostasien” since the beginning of the twentieth century. Ultimately, as the scholar Donald K. Emmerson writes in his 1984 essay “’Southeast Asia’: What’s in a Name?” the concept of Southeast Asia was shaped largely by politics. The scope of the Southeast Asia Treaty Organization (SEATO), created in 1954, was rather broad; it included Pakistan, likely as an anti-India gesture that spoke a great deal about the anti-Communist intentions and the Anglo-American tinkering behind the scenes. It was only after two other failed regional institutions created by non-communist Southeast Asian states that ASEAN was founded in 1967. Importantly, it must be remembered today when ASEAN is said to have no say in national sovereignty that when the bloc was formed it was stringently anti-communist. In fact, anti-communism seemed to be the only concept that bonded the countries at the time. Today, newly-independent Timor-Leste is considered, by most, part of Southeast Asia, though it has still not been admitted into ASEAN (a considerable shame since Timor-Leste is frequently ranked as the most democratic and free of all Southeast Asian nations, and could provide a good lesson for its neighbors). And though Southeast Asia’s geographical scope remains much more fixed today than it was decades ago, it still continues to crop up as an issue periodically, as demonstrated by Philippine President Rodrigo Duterte’s suggestion that Turkey and Mongolia wanted to join ASEAN. The changing notion of a regional identity is not necessarily an obstacle to building a strong sociocultural community. What ASEAN truly lacks is a unifying message of some sort. The European Union, for example, had its founding myth in the Second World War and the call for a “United States of Europe” to forestall conflict. Southeast Asia, however, has no such founding myth today, even if it was initially founded by non-communist countries in the midst of the Cold War. The anti-communist focus of the early years was lost when it admitted Vietnam and Laos. And building intra-regional identity is hampered by the relative ineffectuality of ASEAN itself. This is important. Since the nations lack a historical moment or myth that can unite them, a regional spirit must be created. “Aseanization is pervasive, even if Southeast Asianization is not. From this perspective, the institutional framework of ASEAN is made to define Southeast Asian identity,” Aguilar Jr. argues. Yet, while he is being too kind by the word “pervasive,” it is clear that of there is to be a Southeast Asian identity, ASEAN itself has to foster it. Education is key, experts say. Yet, while some countries have made ASEAN studies part of school curriculum (albeit not a very important part), most favor teaching of their own histories, often with overt nationalistic tones. “The relative youth of nations in the region means that their governments and intellectuals assign great significance to the teaching of their respective national histories, which because of the propaganda value of education often rely on tendentious accounts of the past,” Aguilar Jr. wrote. “Relative to the teaching of national history, the teaching of Southeast Asian history often takes a back seat in schools in the region,” he added. Arguably one of the greatest sources of intra-regional fidelity is the Southeast Asian Games, a sporting event that takes place every two years. But then again, that too has little to do with ASEAN itself.